Microsoft is fond of saying that Windows 10 is the most secure version of Windows ever, but for less savvy users, there is a leap of faith required. That's because many of the security features are either hidden beneath the surface or scattered across Windows. That is something Microsoft will address when it rolls out its Creators Update for Windows 10 later this year. This is an effort by Microsoft to streamline Windows 10's advanced security features so that users have a better understanding of how they're protected and can more easily make changes. As we recently mentioned in an article about what we want from Microsoft in 2017, consolidating some of Windows 10's menu options is a welcome improvement. The Creators Update will also look to close gaps in security. For example, if you have a third-party antivirus program installed and it expires, Windows Defender Antivirus will automatically become the default option until you take further action. Some people may find that annoying, though Microsoft is choosing to err on the side of caution. 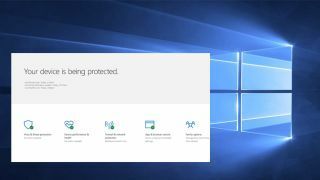 Windows Insiders can get a sneak peek at the Windows Defender Security Center in the latest preview build (navigate to All Apps in the Start Menu) and provide feedback. It will be available to everyone else when the Creators Update rolls out, which is expected to happen in April.